Hyundai Motors India Limited is country’s second largest car maker and largest car exporter. Last year towards the end, the company launched its new small car, Hyundai Eon, which received overwhelming response from the consumers all over India. 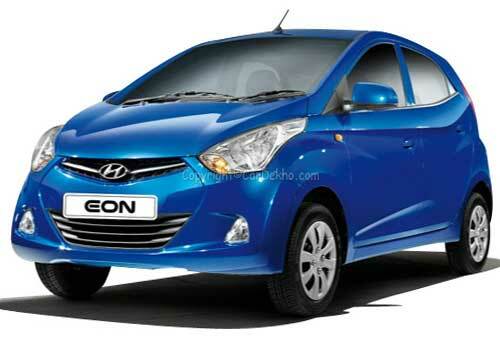 Recently, Hyundai India announced the launch of LPG variants of Hyundai Eon. The firm brought in 3 new LPG variants, namely Hyundai EON D-Lite+, Hyundai EON Era+ and Hyundai EON Magna+. The Hyundai Eon D-Lite+ comes with a price tag of Rs. 2.98 lakh and is jam-packed with numerous features, which include power steering and air-conditioning. The new LPG variants of Hyundai Eon have been specially developed to offer higher value. Customers will have to pay just Rs. 27000 extra to get the Hyundai Eon LPG variant. when looking at the Hyundai Eon LPG pictures, the car doesnt have much changes on the outside as compred to the petrol version. On the launch of the Hyundai Eon LPG variants, the CEO and Managing Director of Hyundai Motor India Limited, Mr. H W Park mentioned that the base LPG model, Hyundai Eon D-Lite plus is loaded with ample of features and the price is less than Rs. 3 lakh, which makes it a car that is value for money. In the same way, Hyundai Eon Era+ and Magna+ are also powered with much improved and enhanced features. The major thinking behind the new LPG variants is to proffer the Indian customers with extra value. Talking about the features of the D-Lite+ version, the car comes with gift shift indicator, air conditioning system, body colored bumpers, power steering and more in just Rs. 2.98 lakh. On the other hand, Hyundai Eon Era+ will further come with central locking system and power windows and will have a price of Rs. 3.12 lakh. The Hyundai Eon Magna+ also incorporates 2-Din audio system with USB connectivity and AUX with a price tag of Rs. 3.42 lakh. This time, Hyundai has taken care of the environment more and made its Hyundai Eon LPG variants a part of Hyundai’s Blue Drive eco-friendly range. The cars come with 32 and 34 litres of petrol and LPG tanks, which ensure complete safety to the consumers along with a 2 year warranty. The specific ‘Toroidal’ tank provides the car with a bigger boot space. Moreover, the Hyundai Eon LPG price does full justice to the car.